Successfully Added Beryllium Quadband Dual Sim World Phone w/ 3.2 Inch Touchscreen to your Shopping Cart. Introducing the latest addition to our exceptional range of touch phones, the M92 Beryllium. This fully unlocked Dual-Sim Dual-Standby world phone comes with full native quad band functionality (850MHz, 900MHz, 1800MHz, 1900MHz) to work on any network or carrier of your choice. Like the element with the same name, our Beryllium is a rarity among its brother and sister phones. It stands out with a huge 3.2 inch crystal clear LCD touch screen and is housed inside a strong, beautiful metal case for everyday use. The simple and elegant interface is easy to use and provides you with the tools and options you need for any occasion. Aside from the standard call functions, the Beryllium offers an abundance of call handling features and PDA software tools to let you stay on top of your work and social life. MSN Messenger: If Obama isn't answering his home phone, then just hit him up with with an instant message! The Beryllium also offers a full assortment of Bluetooth functions so you can hook it up with your Bluetooth head phone for wireless conversations or music. You can even pair it with your Car DVD System for a safer and easier time while driving. With every Beryllium phone purchased, Chinavasion is giving a 2GB TF Micro SD card for free! Yes, free because we believe it is the icing on the cake. With the free 2GB Micro SD card, you can have loads of your favorite videos and music stored inside your Beryllium phone and watch them on the go (this is why it has a huge 3.2 inch LCD screen). You can also record interesting things happening around you with the built-in digital camera and video recorder. This phone even comes with a range of Java games and applications, including a Melody Composer for you to compose your own song and get ready for the next American Idol! This new phone is offered at a low factory-direct wholesale price. 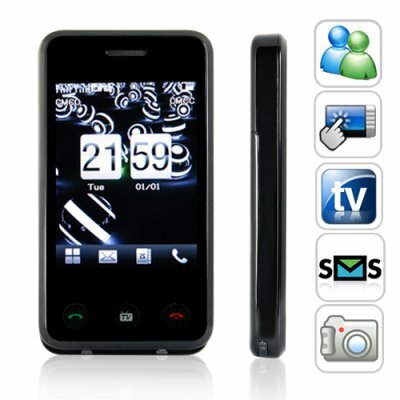 It is a great phone for yourself or to give as special gift for the new year. So order one for yourself or a friend, or order it in bulk for some easy resale profits from eBay or your own internet storefront. No matter what the reason is, click "add to cart" and order your Beryllium phone now, you will not regret it! Click here to view your cell phone network. Does the Beryllium phone come with an analog TV tuner? Yes, watch TV and be happy with the Beryllium. Does the phone come with a contract? This phone is contract- free and fully unlocked so it can work with any GSM service provider you choose. How many contacts can this phone store? The phone itself can store 500 contacts. Each SIM card usually takes 250 contacts. What is speed dial and how do I use it? Speed dial lets you associate your closest contacts with one of the 8 keys of your virtual keyboard (number 2 - 9). To setup your speed dial numbers, go to LOG -> General Call Settings -> Speed Dial -> Set Number, then enable speed dial. To use it, go to Call menu, press and hold any preset number and the phone will automatically dial out. What is IP dial and why is it useful? The name is IP dial, but this feature has nothing to do with IP address or the Internet. What it does is to add a preset number to the number that you are intending to dial out. For example, if your preset IP dial number is 1234, and you IP dial Mr. X, who has number 5678, the phone will dial out 12345678 instead of 5678. Some telecommunication companies offer dial-around services, which are generally cheaper than your standard rate, but you will have to dial a preset number in front of your normal number each time. With the IP dial, you can save this preset number to your phone, and each time you want to use it, just select the IP dial function. Where can I download some great free music for this phone? We love magnatune.com, great music from all genres. Check out Lara St John's amazing version of Vivaldi's Four Seasons or DJ Cary's Eastern Grooves. Aurgasm.us also has some very delicious tunes. It is excellent. The network provider told me I couldn't use a phone bought off the internet because it wouldn't work on the right frequency. I am going to enjoy going in to the store to tell him this phonr DOES work on the right frequency. That will teach them to wreck my phone and expect me to buy another from them!! The phone is quite heavy, but it is solid too, all metal body, unlike the Iphones that cant take much of a knock. I am still learning what this does, but I am enjoying it aleady. A good one! Ergonomic of this phone is beautiful!